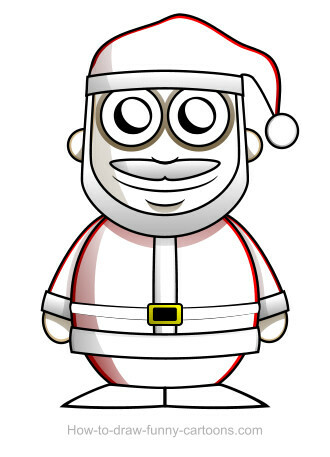 How about working on a nice Santa Claus drawing? Whether you are enjoying a nice drink near the beach or getting ready for the holidays, it's always fun to sketch and illustrate this amazing cartoon character! I'll show you how to draw a round and joyful Santa Claus and how you can make him more alive than ever! Just grab a pencil and a piece of paper and follow me! First, you need to draw the outlines of the character. Start with the head, the hat and the body. Then, you can use a large rectangle to illustrate the large stripe on the bottom of the suit. Two small triangles can be used to illustrate the feet. Of course, it is recommended to use a vector software for this drawing lesson. When you are finished, you can proceed with the next step. 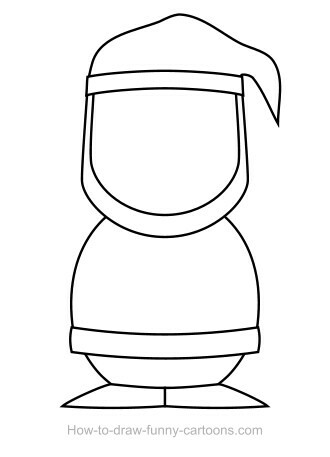 Now that the main shapes are created, we need to add details to make the cartoon character easier to recognize. Work on the head and draw the nose, the mouth, the eyes and the pupils. 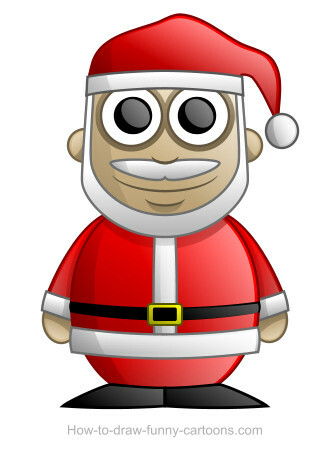 You can also add a moustache and a small line below the mouth to represent the chin. Finally, draw the ears and the beard. Then, sketch more details on the suit of your Santa Claus drawing (like a large vertical stripe and a belt). 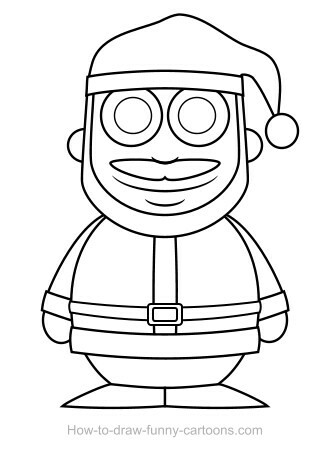 Now that the cartoon character is all drawn, you must add a little bit of color. Let's start with plain colors to help you figure out how we are going to proceed. Draw new shapes behind the outlines and use plain colors to fill these new shapes. The hat must be red and white while the suit must be red, white and black. Don't worry if white areas like the stripes and beard are colored in grey for now. We will adjust these colors later. All vector applications are gifted with a tool named gradient tool (or something similar). With this tool, you can add a second color to any shape. So it's a nice practice to use this tool and create a simple shadow on each shape by adding a second version (but darker) of the color already found on the shape. Now that you have added a second color on all shapes, create a new layer and use it to draw dark shapes on areas that are not affected by lighting. Be careful. You must be aware of how lighting can react and be displayed on all portions of the cartoon character. Shadows must be placed in relevant areas if you want to end up with a realistic illustration. Take your time and experiment as much as needed! Once you think that all shapes are properly placed, select the transparency tool (or the tool used to plain with the shape's opacity). Some applications have stand alone tools to play with transparency while others are using the fill tools to achieve a similar effect. Once you have found the proper tool, make sure that all dark shapes created in the previous step are partially hidden like shown on the illustration on your left. No, we are not finished yet! Shadows are great, but enough to create the desired effect. We also need to create bright areas caused by direct exposition to the light source. To do so, duplicate most shapes and color these new shapes in white. It is also recommended to scale these shapes down a little bit and leave a small space between the outlines. Great! Now select the same tool used earlier to play with the opacity of the solid shapes of your illustration. Once again, you must hide the white shapes and leave a small portion of these shapes visible. While the dark shapes were mostly visible on the left, the white shapes must be visible on the right. See the difference? Now our Santa Claus drawing looks more realistic. Somehow, the character is more alive and more interesting to look at. Now we need to make a single additional change to complete this drawing tutorial. Personally, I like to get rid of black outlines and use colors for a better effect. Black outlines are nice, but maybe not appropriated for the result we are looking for. Just look at the sample of your left to see how you can improve the image with a single modification. Make sure that the colors of the outlines are darker, but still visible.